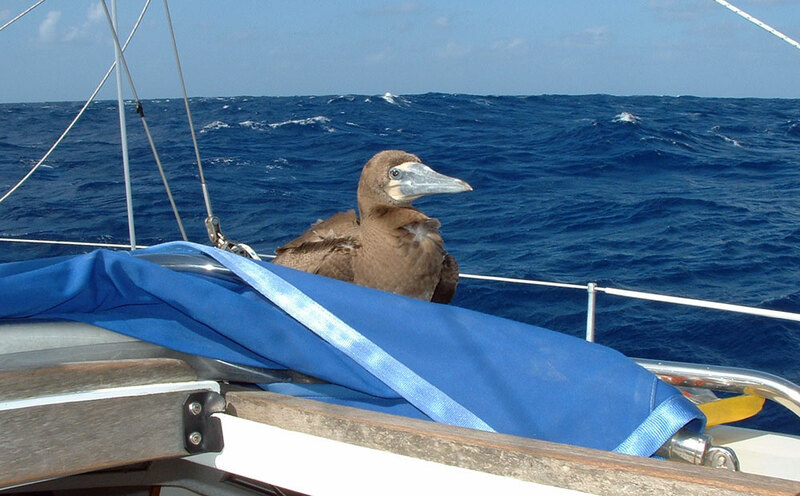 This fellow arrived aboard Alacazam some 500 miles northwest of the Cape Verde Islands during a passage to the Caribbean in January 2002. An immature gannet I thought initially, before Mary referred to Peter Harrison's wonderful book, "Seabirds" which identified him (or maybe her) as a brown booby. Boobies get their name from their tameness and lack of fear of humans; early mariners, who so named them to denote their presumed lack of intelligence, easily approached and killed them. The Bird, as he became known, enthralled us daily with his magnificent flying displays, gliding effortlessly through the wave troughs with his wingtips just clear of the sea. But this aerial elegance evaporated completely once the landing gear was down. We witnessed several cartwheels over the guardwires, tee-bones into the hullside and entanglements with the rigging when things moved into the wrong place after commitment to touch down had been made. Repeated attempts to balance on the guard wires with webbed feet were usually unsuccessful. I was reminded from my school days of having to write out 100 times, the lines: Stupidity is doing the same thing over and over again, and expecting a different result. Long sorties over the horizon were frequent, but not once did we see him diving for fish as boobies and gannets normally do; that is hovering head down over a luckless fish, prior to plunging dart-like after it into the sea. Bird had developed a much more energy efficient technique. 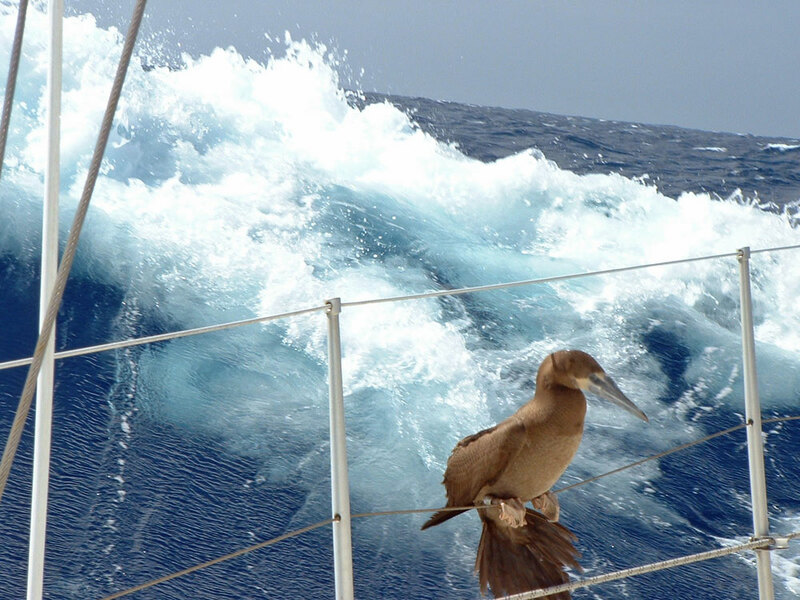 He would sit on the foredeck scanning our bow wave, waiting for a shoal of flying fish to erupt from the surface. Instantly, he would be on the tail of one of them, following its every dip and swerve. 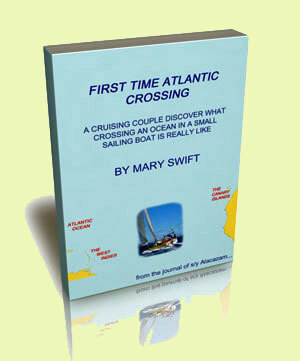 At the end of the chase they would hit the water together, usually to the distinct disadvantage of the flying fish. Surprisingly, when one landed on deck he was not the slightest bit interested in it - We were though; they’re delicious! Other examples of the origin of the expression “bird-brain” were demonstrated regularly. Once replete with fish he took to wandering about on the solar panels, the cumulative evidence of his presence there affecting their production of amps in no small way. Alarmingly, he would edge closer and closer to the adjacent wind generator such that in the end I had to prevent the blades from turning to avoid the inevitable and colourful accident. Even so he would peck at them if he felt that they got too close. This marked the end of free power generation and daily use of the engine instead. Our diet suffered too. Trolling for tuna and dorado was definitely out of the question as I was sure that the daft Bird would have had the lure as soon as it hit the water. The minute the sun went down, he would face into the wind, put his head between his wing feathers like a duck does, and remain so until sunrise the following day. In an attempt to outsmart him, I took to trolling during my night watches whilst he was asleep. I didn't catch anything though, which is presumably why he didn't bother with it. They were kind enough to reply to my letter, informing me that our Brown Booby was ringed at Archipelago de Sao Pedro, Sao Paulo, Brazil (0°55'N, 29°20'W) on the 4th October 2001. If you are "fortunate" enough to provide a berth for such a passenger, the Seabird Group will always appreciate a record of your observation. 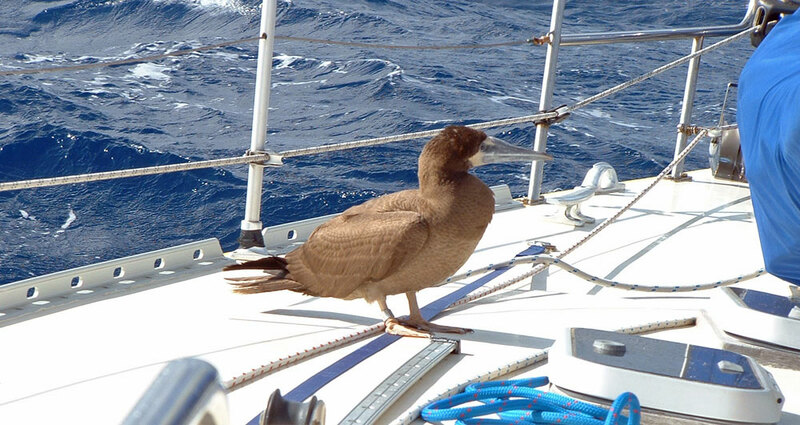 Our Bird stayed with us for 11 days, leaving us some 330 miles east of Guadeloupe. To our great surprise, we missed him - a lot! 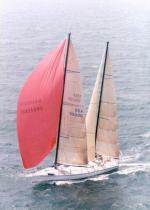 "Seabirds" is published by Christopher Helm (Publishers) Ltd, a subsidiary of A & C Black (Publishers) Ltd. The Seabird Group, c/o the Royal Society for the Protection of Birds, The Lodge, Sandy, Bedfordshire, SG19 2DL.